Stop vibrations, prevent noise – this is the working principle of Schrey & Veit rail dampers VICON AMSA. The damper is installed directly to the rail between the sleepers. When a train passes the track, the rail damper decreases the rail vibration and the emitted sound. Schrey & Veit rail dampers VICON AMSA are designed at the laboratory and tested on-site. Their silencing effect is directly audible. Also, the “singing rail” effect is avoided, the approaching train is only noticeable at the last moment. The western movie trick of placing an ear on the track, to recognize the approaching train, is not longer recommended on lines with Schrey & Veit rail dampers. Although the noise reduction is less: Compared to conventional noise barriers, Schrey & Veit rail dampers VICON AMSA are virtually invisible. The view across the railway track remains open, no large metall shields are blocking the neighborhood outlook. Especially on elevated track sections this is an important advantage. Furthermore: Passengers will not suffer from the ‘tunnel feeling’ – the passing landscape remains visible. Schrey & Veit rail dampers VICON AMSA acting according the mass-spring principle. Its individuality is leading to a high performance: The track construction is considered during the vibrational design while the rail dampers back side shape is fitted to the rail profile. Due to the large surface contact, the maximum vibration energy can be transferred into the rail damper. After adjusting the rail dampers back side, the Schrey & Veit rail dampers VICON AMSA plays their unique strength: At the rail test bench, the technical performance is individuelly tuned to reach the highest track damping effect. The vibrational nature of the track is derived from on-site measurements or numerical prognosis, e. g. by the well known STARDAMP approach. Main criterium is the track decay rate. 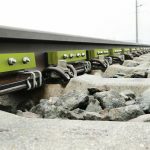 The individual design of Schrey & Veit rail dampers VICON AMSA allows the application on ballasted as well as slab track, which is often used on highspeed lines. Also, the combination with other measures is possible – large, disturbing noise walls can be avoided in an intelligent way. All Schrey & Veit rail dampers VICON AMSA are tested by independent experts. According the national specification, different homologations have been received. In parallel, the acoustic performance is quantified (in line with the individual regulation) by measurement and/or prognosis calculation. Detailed information on individual homologations can be found in the Download Folder under approvals. If the rail vibration is damped by rail dampers VICON AMSA, often the corrugation growth is also reduced. This leads to less rail wear and cuts maintenance expenses due to the extended rail lifetime. Caused by stronger noise limits, newbuild rail vehicles are more silent than older ones – thus, the vehicle’s percentage on the total rail noise is decreasing. The track noise becomes more often the dominating source. Rail dampers VICON AMSA are showing in more and more cases a higher effect. The ongoing freight wagon brake replacement is not changing this fact. Note: In contrast to vehicle-bound measures, rail dampers are acting on mostly all vehicles. A significant advantage against the background of Europe’s free network access. Rail dampers VICON AMSA are installed also in hard to reach track sections like tunnels and cuttings. Main reason is the decrease of the vehicles interior noise. However, the technical product requirements are much more comprehensive. Therefore, Schrey & Veit rail dampers VICON AMSA are made from hardly inflammable materials and tested for fire proof. With more than 600,000 installed Schrey & Veit rail dampers VICON AMSA all over the world, the rolling noise is reduced by up to 6 dB. Since the product launch, Schrey & Veit rail dampers VICON AMSA had been tested and qualified in various ways. Mutliple impacting criteria had been assessed. Examples are shown in the diagram: When different train types are running on the track, the noise reduction varies according the vehicle noise percentage on the total noise. The blue columns are representing the Schrey & Veit rail damper VICON AMSA – it’s high effectiveness is clearly visible at all of these train types. Two further examples from a metro line in Perth (Australia) are also documented in detail. At first, a tunnel section was equipped (improving the interior noise). Furthermore, an open section is also equipped to ease the rolling noise and curve squealing at adjacend bungalow areas. Beside the impressive video clip, the Test Report presents more details and the complete measurement results.